This is the first historical romance I’ve partaken of in audiobook format, and I adored it. I’m not sure if that’s because of the genre or that someone read it to me—someone with an English accent. Whatever the case, I’ll be grabbing more of these. I wasn’t sure I was going to like the narrator Rosalyn Landor’s voice at first. During the prose portions of the book she sounded a bit older—how you’d imagine a stuffy Englishwoman of the Regency period would sound. And then she got to the dialogue and I loved her. I was super sold. She gives Minnie and Robert such personality. Okay, so enough about the lady performing the audiobook, how about the book itself? I loved this book! We’ve got a duke who doesn’t like that he’s a duke, and in fact wants to end the peerage altogether, thanks in large part to the awful example his cruel and selfish father set. Robert wants to right as many of his father’s wrongs as he can. But in doing so, he’s fouling up Minnie’s life because the local law is positive she is the individual behind the radical flyers being papered all over town. Minnie can’t afford to have anyone digging into her background. The only fix is to discover the true culprit and bring them to justice. But what can she do when the true culprit is an untouchable duke? One thing I find with audiobooks is that I have trouble with the minor characters' names and jobs…that’s no fault of the author’s. The bad guy was some sort of military man installed in town to keep order (again, I forget exactly, I’m sorry! ), and he did so with disturbing fanaticism. He’s a great bad guy in that you understand why he’s doing what he’s doing even if we never get inside his head. He provides the incentive for Minnie and Robert to be at odds, and comes back with a vengeance later in the book. *gnashes teeth* Then there’s Robert’s heartless mother who will leave you yo-yoing through emotions right up to the end of the prologue. Robert's friends are also a hoot—and one even gets his own book, the next one I think (and yes, I’ll be reading that one). 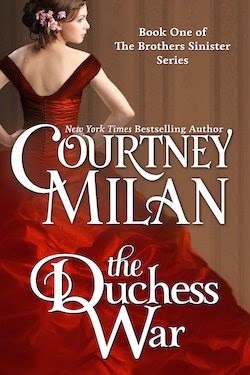 All of Ms. Milan’s characters behave the way they ought to…I know it seems odd that I constantly include that line in my reviews, but seriously, there are far too many books out there where I’ll drop the thing in my lap and be like, ummm HUH? Why did they just do that? That didn't happen in this one. You may say, “But, Drea, this is just another wallflower-gets-the-super-hot-Duke story!” Okay, sure, that trope is in this. But I found The Duchess War more believable than my favorite Tessa Dare iteration of this trope, A Week to Be Wicked, because there’s backstory for why Minnie isn’t actually a wallflower. Yes, it’s a little…well, epic, but throughout the story Ms. Milan does “show” us that Minnie is capable of exactly what she claims. Maybe it’s that I’m not all that intelligent, but Minnie was Sherlock-level in spots and was able to keep ahead of Robert at every turn. Why wouldn’t a duke fall for a woman who could keep him on his toes? A few more gushing pros, I laughed aloud several times. Robert was adorable with all of his paste puns. But I’ll be the first to admit that I likely wouldn’t have cracked a smile at the puns if I’d read the book rather than listened. And…well, Robert is just plain adorable period. Grab this book if you love handsome dukes who just want to be loved. Challenge Update: This is book eight toward the 2014 Historical Romance reading challenge I signed up for ages ago. I have four more to go! I'm glad you had a great time with this one. I'm not sure I tried a book by her but not sure I'll try in audiobook, I'm too long with them. Great review! I have a love / hate relationship with narrators who have English accents; sometimes it can really add something to the story, while as others it just comes off as snooty. This audio seems to have fallen into the former category which is good, and I have a hard time resisting a 4.5 star Historical Romance review, so I won't. Hehe SOLD! "Snooty" does describe the narration on the narrative parts, but I got used to it, and she does a good job with the character voices (they weren't snooty). OMG why haven't I thought of listening to historical?! Gawd! 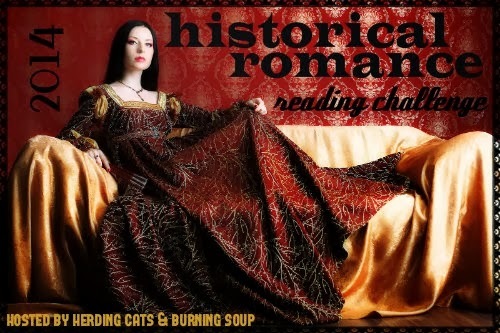 I don't like fictional audio, I can do non-fiction though, but you raised some points that makes me think maybe historical romance is a better fit for me. The accent, the lilt, the banter in British accent, gosh it's like Jane Austen all over again!!! 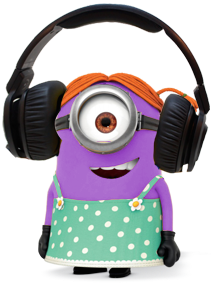 I'm listening to Outlander right now, it's 24 hours of audio, crazzzyy long. But it's got an English narrator narrating a whole bunch of Scottish guys. I dig it.